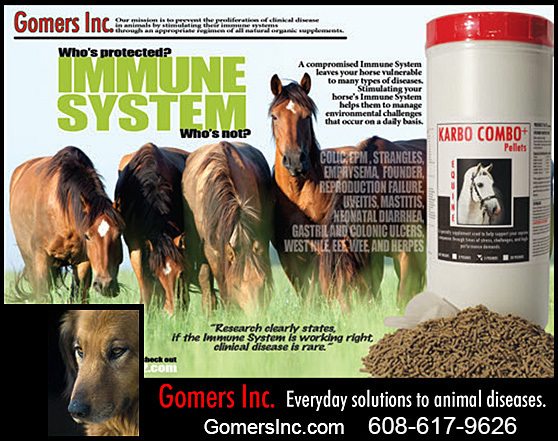 Karbo Combo by Gomer’s Inc. has been helping boost the immune systems and supporting the body to fight against bacteria, protozoa (EPM) and even viruses that can weaken your horse’s body. All of the products at Gomer’s Inc., have been researched and developed by Dr. Russell C. Smith, DVM. Dr. Smith has been a veterinarian for over 55 years! He graduated from the University of Minnesota in 1955, Receiving degrees in Animal Science along with his DVM. After working in a few small veterinary clinics in Wisconsin, he set up his own clinic just north of Madison, Wisconsin. He operated the clinic, practicing on both large and small animals until 1985. At this time, Dr. Smith sold the clinic to focus his endeavors on homeopathic ways to increase health and production in the animal industry. To this day, he still does nutritional and fertility consulting. What IS Karbo Combo and Why Would Karbo Combo Greatly Benefit My Horse? Well, we are glad you asked! In a sentence, Karbo Combo is an aid to promote wellness and to support the immune system from daily stress and environmental challenges. To increase health, genetic expression and performance, eye health, hoof health, neurological health, digestive health—and so much more! Karbo Combo+ is our signature specialty supplement that combines the active ingredients of Karbo Flour or Pellets and Epic II CL into the Karbo Combo+ pellet. Our Karbo Combo+ combination offers animals’ immune systems multiple advantages in resisting bacteria, viruses, protozoa, fungi, toxins, aflotoxins and environmental challenges. When immune systems are working right, clinical disease is rare. Karbo Essentials+ is a unique concentrated formulation, available in a powder form for the young or smaller animals with compromised immune systems. This concentrated formula of micronized food particles allows for quicker digestion and can be mixed with yogurt, milk replacer, or soft food. Karbo Essentials+ can also be mixed with a liquid for animals refusing solid food. Karbo Essentials+ has proven especially helpful in supporting the immune systems through challenging symptoms of diarrhea and dehydration in newborns caused by pathogenic bacteria, viruses, protozoa, fungi, environmental stress and especially disease parasites such as worms, Coccidia and giardia. So How Does Karbo Combo Work? Karbo Combo contains five key components within its ingredients formulation: pre-biotics & pro-biotics, oligosaccharides, sarsaponins, glycoproteins, and water and lipid soluble ions. These five key components all complement each other in order to keep your horses healthy and support their athletic performance to fulfill your expectations. Karbo Combo contains the combination of supplemental nutriceuticals that your horses utilize on a daily basis. Together with your veterinarian, our goal is to help bring your horse to optimal health and well being. The microencapsulation of beneficial bacteria, enzymes and vitamins, are the tools to improve the genetic expression and performance that you demand from your horse. When using Karbo Combo at just 1 ounce per 1000 horse per day as a maintenance schedule, your horse will be able to withstand the environmental challenges they face on a daily basis. The old adage that an ounce of prevention is worth a pound of cure truly hits Karbo Combo spot on.!! Is It True That Karbo Combo Can Help My Horse Absorb More Nutrients, Fight Ulcers and Maintain Better Digestive Health? Yes! Karbo Combo lends real support to your horse’s digestive system! Pre-biotics and pro-biotics are a necessary factor in the Karbo Combo formulation for two main reasons. First, when ingested by the horse, they occupy all villa in the bowel allowing for more sites of attraction by the pathogenic viruses, bacteria, toxins, and protozoa that may be infecting the horse. Secondly, pre-biotics and pro-biotics are not used as nutrients by the horse. Therefore, together, these two factors force the organisms out of the horse’s body since the organisms bind to the non-digestible pre-biotics and pro-biotics, which are then rafted out of the body and no longer infect the horse. What If My Horse Has Laminitis, Breathing Problems, EPM, Cancer, Or Suffers From Disease and Illness? Karbo Combo’s unique formulation based on decades of veterinary experience in the horse world, has been shown to be successful in numerous situations and applications including Laminitis, EPM, or other illness and diseases. Karbo Combo’s unique formulation is toxic to pathogenic bacteria and it’s ability to support the immune system is hard to duplicate! Karbo Combo promotes wellness— naturally. You’ll be amazed at the difference it can make for your horse! Is It True That Karbo Combo Can Help My Horse With Uveitis, Pink Eye or Other Eye Concerns? YES! One very important reason that water and lipid soluble ions are a necessity in the Karbo Combo formulation is to combat the detrimental effects of mycoplasma, the cause of uveitis and pinkeye, mastitis in the mare, and metritis in the uterus of the mare. Mycoplasma has the ability to produce pathogenic diseases in humans, animals, birds, insects and plants. With mycoplasma having the ability to suppress the immune systems of the horse, pathogenic organisms have free reign to cause devastating and untreatable mastitis and metritis. Dr. Dave Van Metre, Extension Veterinarian with Colorado State University, says, “if the bacteria is a mycoplasma, it needs to be treated with a drug that has lipid-soluble properties.” Additionally, field and laboratory studies conducted by Upjohn Veterinary Products indicate that if the immune systems are working correctly, clinical disease is rare. What Do Horse Owners SAY About Karbo Combo? Because of Karbo Combo, my 5 year old mare Scarlett has now been 4 months without a Recurrent Uveitis attack, longest remission time ever since diagnosed a year ago! After starting Karbo Combo, results were seen in just 4 days, when it cleared up a 2-month-long flare up. Even after the cyclosporine implant surgery, her attacks were still every 2 months, each lasting 2 months or longer. All the antibiotics, eye ointments, pain/inflammatory meds, nothing seemed to help. You could see the damage each attack was doing to her eye and bringing her closer to blindness. Because of Karbo Combo her eye has never looked more clear and healthy than it does today! This supplement is amazing! I have kept a detailed history of each attack, how long it has lasted, before and after surgery, medications given and how often. I am also continuing to record her progress since starting Karbo Combo, so I may share these incredible results with her doctor from U of I, her surgeon, and her veterinarian. They will then see the undeniable facts for themselves. I've had my 24 yr old mare, Merlot, on Karbo Combo for the past 2 years. I had initially started her on it because she had a "breathing" issue. We thought it might have been caused by dust or a fungus. She also has arthritis in her shoulders. Before I had started her on KC, she was on a joint supplement and B-L solution. After I started her on the KC, about 30 days later I did notice that her breathing wasn't as raspy and seemed a little quieter. When I started giving her the KC, I stopped her joint supplement and stopped giving her the B-L Solution. Even though we have very mild winters here, in the past Merlot was always stiff and sore even when we turned her out during our colder months. The past two winters, she seemed to be moving around much better, and her breathing is still quieter. When we turn her out now, she prances to the gate and takes off at a full run, kicking up her heels when she is turned loose. She looks really good. I couldn't be happier with the results of Karbo Combo on Merlot. I started my Tennessee Walking horse, Mikey, on Karbo Combo a few months ago, around February. He has chronic summertime allergies, so I had planned to try the KC product to help him with that. However, he had consistent diarrhea, so I started him sooner. His diarrhea stopped after just a few days and nothing else changed for him diet wise so it had to be the KC that helped it. Will fill you in on the allergy situation as the summer progresses. The other horses got some too and the results were fantastic! Our other TWH gelding's legs grew longer,or so I thought, until I realized it was the lack of bloating that was missing. He is 27 so growing longer legs really wasn't possible! And all of them have a lot of good energy and dapples. Recommending KC to all of my clients, and hope to have a horse world filled with glowing horses! Thank you. I own two quarter horses and two Friesians, the quarter horses are both performance horses, reining and reined cow horse. All four of them are on daily Karbo Combo regimen. When I first heard of Karbo Combo I was skeptical of all the claims made,they sounded too good to be true. After using the pellets, I can now say with confidence that Karbo Combo does what it claims to do. Our horses have never coliced and have been tested regularly for worms. I haven't used a dewormer in 8 months best product I have used thanks to Gomers Inc. I will be a life long customer. I started my barrel horse on the Epic II CL and the Karbo Pellets about a month ago. She had lost weight, her coat was dull, her performance was down and she showed symptoms of EPM. After 30 days on the double dose of these products and some time off, she is a different animal! She has gained back at least 150 lbs and is working like never before! I plan to keep her on the maintenance does of Karbo Combo and get my other horse on the program too. Thank you, I am so glad I found out about your product. Thanks for talking to me a few weeks ago about the karbo combo pellets. My thoroughbred, CJ, was diagnosed with EPM on Nov 1, 2007 and after 5 weeks of the Marquis he had improved but was still very clumsy with his hind leg and could not support a rider at the walk. The day before I started him on the pellets, he was found laying down in the pasture and couldn't get up (likely fell or went down to roll and couldn't rise without our help). After one week of the pellets, he was not only trotting in the pasture but actually had that beautiful floating gait of a strong, coordinated horse. This week (12/17/07) he is able to carry a rider at the walk. You are welcome to post this on your web site if you find it useful. You can read more TESTIMONIALS on our website! There is just no practical reason not to have your horse’s on Karbo Combo! For under $1.60 per day , the health benefits are limitless! Join the thousands of happy horse (and dog!) owners who have their horses and dogs on Karbo Combo today and call now! We are happy to find out more about the health concerns you are experiencing and how Karbo Combo can help!